The south Indian state of Kerala stretches in a narrow sliver of land along the coast, rich in cultural heritage and natural attractions. A trip to Kerala takes you to a tropical paradise of sandy beaches and swathes of coconut groves. Considered one of the most literate states in India, Kerala is also a religiously diverse region, where Hindu temples stand next to Islamic mosques, and Christian churches rub shoulders with Jewish synagogues. Numerous wilderness areas dot this relatively small state, ensuring plenty of opportunities to spot rare birds, wild elephants, and the occasional tiger. Kochi (Cochin): Lying on the edge of the Arabian sea, this center of the spice trade since the 15th century blends local traditions with international cultures in museums, landmarks, and architectural wonders. Thiruvananthapuram (Trivandrum): If you're looking for a mix of urban and rural things to do in Kerala, the state capital offers everything from modern life bustling in markets and cafes to colonial architecture and ancient temple grounds. Thekkady: Surrounded by a man-made lake, this city offers sanctuary to numerous species, including elephants, deer, and tigers; meanwhile, plantations of tea, vanilla, pepper, and coffee add flavor to your tour of Kerala. Munnar: Tucked in the hills among three rivers, the small town of Munnar draws visitors with tea plantations, historic buildings, and peaceful spots close to a large national park. Kalpetta: Full of modern and natural Kerala attractions, the urban area of Kalpetta lies surrounded by lush plantations of tea and coffee, while cultural sites such as temples and historical institutions dot the scenic landscape. 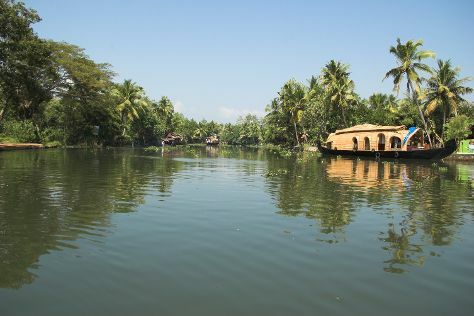 Kerala Backwaters: Take a boat tour of Kerala along this intricate network of waterways, with 900 km (560 mi) of lakes, estuaries, and lagoons that lie next to peaceful villages. Chinese Fishing Nets: This unusual exhibition of nets stretches between wooden pillars, reminding visitors of its colonial history and serving as an authentic part of life in Kochi. Tea Gardens: Add the Tea Gardens to your Kerala itinerary and enjoy the serene terraces overflowing with vegetation, as well as the tea museum. Mattupetty Dam: Picnic at the scenic waterfront by this dam, and take in the sight of lush forests and rich wildlife. Tea Museum: This modern museum shows the process of growing and brewing one of the world's most popular beverages, through several exhibits surrounded by plantations. Varkala Beach: Believed by locals to wash away sins, the crystal clear waters of this beach are perfect for cooling off and enjoying a scenic view of the Arabian Sea. Sree Padmanabhaswamy Temple: Hiding treasures in vaults deep underground, this temple deserves its title as the richest in the world, with some parts of the complex still unexplored. Top Station: A must on any outdoorsy Kerala vacation, Top Station takes you to the highest point of Munnar at 1,700 m (5,577 ft), affording a scenic view of the Theni District valleys at the foot of the Western Ghats. Kerala Kathakali Centre: Get to know the culture of Kerala through the ancient ritual of dramatic dance and martial arts, depicting stories from religious texts and folklore of the area. Rajamalai (Eravikulam) National Park: The untamed nature of the park grounds has earned it a place on the World Heritage List; look for the endangered Nilgiri ibex, which lives on the grass of this 2,000 m (6,561 ft) high plateau. The best option for your family holiday in Kerala is to choose one city as a base, making shorter excursions to other parts of the region. Munnar stands surrounded by picturesque hills in a secluded location, and offers plenty of museums, sports activities, and natural attractions to thrill visitors of all ages. Nature enthusiasts may want to consider staying in Kumily, with its close proximity to Periyar National Park in the Kurushmala Mountains. Adults and kids alike can enjoy hiking and picnics at a higher altitude with a scenic view. Plus, this "Spice Garden of India" is a heaven for retail therapy. Another destination that combines the new with the old is Kochi (Cochin). Here, you can explore the city's Chinese, Arab, and European influence in historical attractions, as well as the bustling modern-day port and many shopping areas. With so many different things to do in Kerala, you may have a tough time deciding what to visit. Families looking for a tropical holiday should head to Kovalam Beach, a secluded, crescent-shaped shore where the parents can sunbathe while the kids splash around the rocky seaside. The picture-perfect shore at Lighthouse Beach features silvery sand and tall palm trees, plus a 30 m (98 ft) lighthouse. A Kerala holiday wouldn't be complete without glimpses of the state's wildlife. Take a boat ride down the river at Periyar Tiger Reserve, where you'll learn about the endangered species that find sanctuary here. Idukki Wildlife Sanctuary also houses threatened species in a peaceful environment the whole family can enjoy. Round out your Kerala itinerary with some old-fashioned fun at an amusement park. Wonderla Amusement Park boasts several roller coasters and arcade games in addition to water slides, a wave pool, and an impressive musical fountain. Fantasy Park claims the title as the state's oldest, welcoming locals and visitors to its rides and water attractions since 1996. Eternally sunny, lively, and interesting, Kerala makes for an excellent place to take kids--even in the winter--and the diversity of experiences will stay with them for the rest of their lives. Whether you stay in an exclusive hotel or a rural cottage, the people of Kerala love children and appreciate family life, so prepare for a warm welcome with plenty of smiles. If you opt to rent a car for your Kerala trip, note that most vehicles do not have child seats, so bring your own and save yourself the hassle of an uncomfortable drive. Often called the "Land of the Spices," Kerala features aromatic dishes with spices and/or coconut traditionally served on banana leaves. (The coconut absorbs some of the heat, so most palates should be able to handle it.) What you eat on your tour of Kerala partly depends on where you are: the coastal part features lots of seafood; vegetables rule in the plains; and meat forms the base of dishes in the north. But everyone seems to agree on flavoring with mustard seed, chili peppers, and curry leaf, alongside tamarind and tomatoes. For the sweet side of things, cashews, dried banana slices, and jackfruit chips cool you off after a spicy meal. If you're looking to try out some local recipes yourself, head to Cochin Spice Market to stock up on spices. Otherwise, just duck into one of Kerala's many restaurants in between sightseeing. You'll have an array of tempting choices when it comes to selecting gifts and souvenirs of your Kerala vacation, most available at the local markets. Get yourself top-notch spices at low prices at places like Abraham's Spice Garden or any of the bazaars. Likewise Kerala's famous tea and coffee can be purchased just a few miles from where it's grown. Besides these epicurean treats, essential oils are extremely popular at markets like Chalai Bazaar, where they are sold for cosmetic and alimentary purposes. If you're looking for crafts, the skilled artists of Kerala sell handmade pieces from coconut, wood, and even metal, while Kathakali masks come in different shapes and sizes, including magnets, hanging pieces, home décor, and jewelry. Also look for the traditional clothing of the Malayalee people, including mundus and sarees, in a range of bright colors and embroidery. ●	The state animal of Kerala is an elephant, which is associated with the divine and depicted on the government's emblem. ●	Running parallel to the state's western coast, the backwaters of Kerala extend for an estimated 900 km (560 mi) of canal labyrinths with small islands and lakes. ●	Kerala has a 100-percent literacy rate. If the timing's right, you may have the chance to experience one of the state's many colorful celebrations during your Kerala vacation. Kerala's festivities are too many to count: vibrant, multiday affairs with feasts, dance, and plenty of joy, they present the perfect opportunity to immerse yourself in the state's specific cultural heritage. The ten-day long state festival of Onam takes places between August and September, observing the arrival of King Mahabali with games, races, and Kathakali dance, as well as the elaborate flower rangoli. According to the ancient calendar of the Malayam people, the Vishu festival in April marks the beginning of a new year by looking towards the Kani-Kanal and offering garlands to Krishna. Also in April, Thrissur Pooram worships Lord Shiva through music and fireworks. Another major festival, the ancient celebration of Theyyam features 400 different kinds of dances performed in deity costumes with bright colors, intricate masks, and flowers. The festival has three parts, where the deities first decorate themselves, then perform self-torture rituals, finally ending the show with dancing to celebrate life. With its various geographical features, Kerala experiences different climates in different parts of the state, although an equatorial tropical climate dominates the largest region. Mountainous areas remain cool, while the plains get humid and hot during certain periods due to common rainfall. Still, four seasons prevail: winter, summer, southwest monsoon, and northeast monsoon. The winter stretches from November to February, when the temperature in the hills can drop to 10 C (50 F) with no precipitation. Because of the mild weather, tourism in Kerala peaks during January and February. Summer, on the other hand, has rainfall with thunderstorms, and temperatures rise over 40 C (104 F) in the plains. The southwest monsoon season at the end of September breaks the heat, with incredibly high levels of rainfall that nourish the lush green landscape. From October to November, the northeast monsoon season rules with a hot, humid climate and occasional rainfall with thunderstorms. Certain tourists interested in Ayurveda medicine treatments plan their trip to Kerala during the monsoon season, when the pores open and fully absorb the therapeutic oils. A very intricate network of roads has given Kerala tourism a boost, and making it easier for tourists to reach the more secluded but beautiful locations. If interested in car rental, explore options in the cities. Additionally, a large number of airports across Kerala connect the popular region with international destinations, as well as major cities in the state. Taxis, though pricey, offer fast, comfortable travel between Kerala's attractions, while auto rickshaws offer a more affordable choice within cities. Alternatively, you can board a local bus at any stop; these range in price because of different destinations. A more picturesque way to travel is by railway: though fast trains only connect major stations, they offer a splendid view of the Kerala landscapes and rural sites.